Tuscany is one of Britain’s best-loved Italian holiday destinations, and with good reason too – the region is home to the Italian Renaissance, good food, charming towns and villages, luscious countryside and rolling vineyards – what more could you want from an Italian holiday? If you’re planning on staying in one of our beautiful hand-picked hotels, apartments or villas in Tuscany, read on to discover the places that you need to visit during your trip. It was almost impossible to condense the list down to just these choices – by all means, feel free to explore the rest of what this wonderful region has to offer! Well worth a visit for its rich history which stretches back to the Middle Ages, Siena’s historic centre is a UNESCO World Heritage Site with plenty to see including the fortresses of the Medici family, the Gothic Cathedral and Palazzo Pubblico and numerous churches. The city is also steeped in tradition, with one of its most famous being Il Palio, the popular horse race which dates from centuries ago. 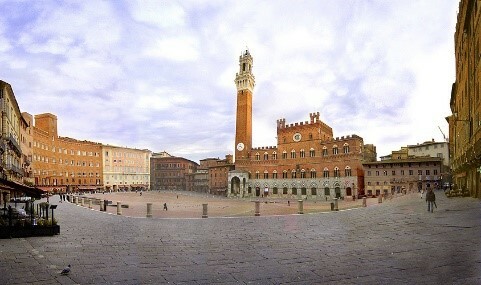 Surrounding Siena are beautiful castles, farmhouses and flourishing green landscapes. If you’re seeking to immerse yourself in world-famous, authentic Italian arts, culture and food, Florence is the place to go. Considered by many as the birthplace of the Renaissance, the city is filled with artistic treasures, from the Galleria degli Uffizi to the Duomo. The city is also filled with luscious scenery, from the River Arno which flows through the city to the scenic gardens and parks found throughout. Lucca is a truly magical place, where you can stroll along and take in the robust ancient walls with their tall and proud towers, offering up sweeping views of the city from a fantastic viewpoint. A short distance from Lucca is the Versilia region, a series of fashionable Riviera resorts popular for its nightlife and sandy beaches. Now printed on many a wine bottle in the UK, Chianti is the wine powerhouse of Tuscany, home to a variety of vineyards and wineries, each unique in their own way. A truly one-of-a-kind landscape, the Chianti region offers up incomparable views of green gentle hills carpeted in vineyards and olive groves. Many wineries are open for tours and tastings – an invaluable experience where you can experience the true flavours of Italy. The Leaning Tower may instantly come to mind when you think of Pisa, but there is so much more to this historic city than meets the eye. The medieval old town, baptistery and cathedral are definitely worth a visit, with the city centre offering a vibrant café and bar scene, ideal for a break in between soaking up the sights. With its many natural hot springs and thermal baths, a visit to Pisa is also a great opportunity to have a much-needed relax. Another Tuscan UNESCO World Heritage Site, the Val d’Orcia is full of stunning examples of natural, historical and cultural heritage in the form of both its spectacular rolling landscapes and its quirky medieval towns such as Montepulciano, Pienza and Montalcino. Crossed by its namesake river, the Val d’Orcia is definitely worth exploring just to take in the stunning views of the gentle undulating hills and pretty towns dotted throughout. Situated midway between Florence and Siena, San Gimignano is also known as the ‘city of beautiful towers’, and with 14 of them stretching to the skies throughout, you cannot miss the view they create across the skyline. 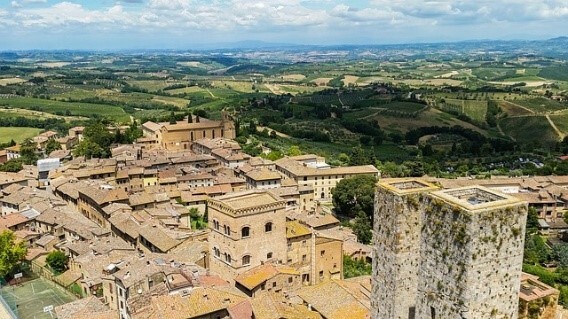 Although it is only a small place, San Gimignano has plenty of must-sees, including the Duomo, Palazzo Comunale, Torre Grossa and the Pinacoteca museum, all of which have contributed to the village becoming a UNESCO World Heritage Site. The Maremma region is packed full of surprises and has something to offer for everyone, from the coast to the secluded inland. Its sights are truly unrivalled, from its long sandy beaches and blue waters to green rolling hills, thermal baths and pretty medieval villages. For those interested in ancient history, Maremma is perfect to explore and find out more about the Etruscan people who once ruled the region, and for those looking for authentic Italian flavours, there is plenty of delicious food and wine to sample too. Situated on the top of a hill overlooking the Val di Chiana 600 metres above sea level, Cortona is one of the best sightseeing towns in all of Tuscany. Enclosed by stone walls which date back to the times of the Romans and Etruscans, Cortona also has plenty of history to share within its boundaries, with medieval buildings and narrow lanes each having their own story to tell. The Tuscan Archipelago is located between the Ligurian and Tyrrhenian Sea, and is made up of seven scenic islands, with Elba being the largest and best-known. Elba is in fact the third largest Italian island, after Sicily and Sardinia, and has plenty to offer to locals and tourists alike, from sandy beaches and clear blue waters to its fascinating Etrurian fortresses.